Motorcycle protective apparel retailer introduces the brand new Shark Raw Motorcycle Helmet. This helmet is sure to catch the attention of pedestrians and motorcycle riders alike for its very unique profile. Shark is a motorcycle helmet company that consistently pushes the boundaries of design and ingenuity in every product they make. Founded in 1986, they create every motorcycle helmet with safety and styling in mind. These attributes can be found in all of their popular motorcycle helmets such as the Evoline 3 ST, Speed-R, Vision-R, S700 Redding, and the Race-R Pro. This year they are looking to further strengthen their reputation for style and safety by introducing a bold new motorcycle helmet into their repertoire with the new Shark Raw Helmet. The brand new Shark Raw open face motorcycle helmet is without a doubt one of the most intriguing helmets coming to the U.S. for August 2013. Julio Grullon, Motochanic Co-Founder: “This helmet is sure to catch the attention of pedestrians and motorcycle riders alike for its very unique profile.” The designers achieved this by reimagining the basic concept of an open face and made it their own, starting with its overall look. The Shark Raw Helmet is designed with the casual and urban street rider in mind. With that, the first step was to change the look of the open face helmet was to completely do away with the conventional face shield. In its place is an anti-scratch & anti-fog quick release goggle system that comfortably fit over glasses. Replacement goggles are expected to become available soon after the helmet arrives in North America. Another great feature that this helmet brings is its detachable face mask. The face mask attaches to the bottom portion of the goggles, providing protection from wind and road debris at higher speeds. When the mask is detached, it can conveniently be stored away in the motorcycle’s trunk space or in a travel bag. Now, what is it that makes this helmet a product worth considering? At first glance it has a stoic, yet aggressive demeanor. It is sure to win people over with its character and unique design. Frankly speaking, there aren’t many others like it. It will come in a number of colors and finishes to match your style. When it arrives to North America, it’s sure to be a popular item this motorcycle riding season. 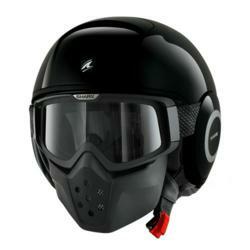 The Shark Raw Helmet is now available for pre-order at Motochanic.com, and is expected to ship in August 2013. Motochanic, LLC is an online retailer of motorcycle gear, motorcycle helmets, and accessories, with an extremely popular motorcycle gear retail store in New York City area.